*UPDATE*- I made this again for my friend Danielle's birthday in the big bundt. The icing worked much better this time. I just globbed it on and swirled it around a bit. Do not try to spread it like normal icing. Isn't it cute with the pink sprinkles? I knew I needed to make this cake after I saw it on my friend Erika's blog.The original recipe is from here. Mmmm I love root beer, I love chocolate, and I love cake. Match made in heaven right? Right. 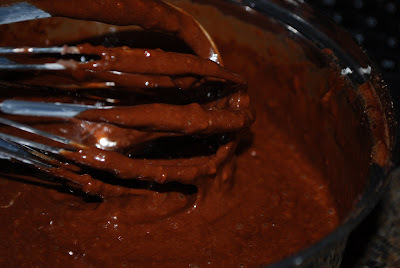 :) Just a few hurdles to overcome before I could get this bundt in my oven. 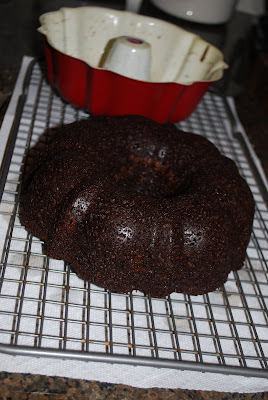 My first obstacle- no bundt pans. No problem! I hopped on Amazon last week and ordered these babies. One baby bundt and one momma bundt for $16.95 to be exact. 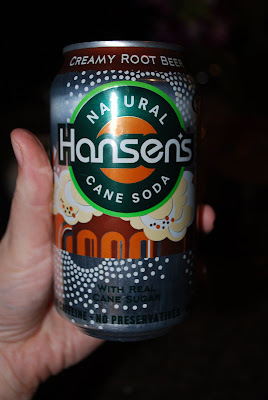 Second obstacle- root beer made with cane sugar. 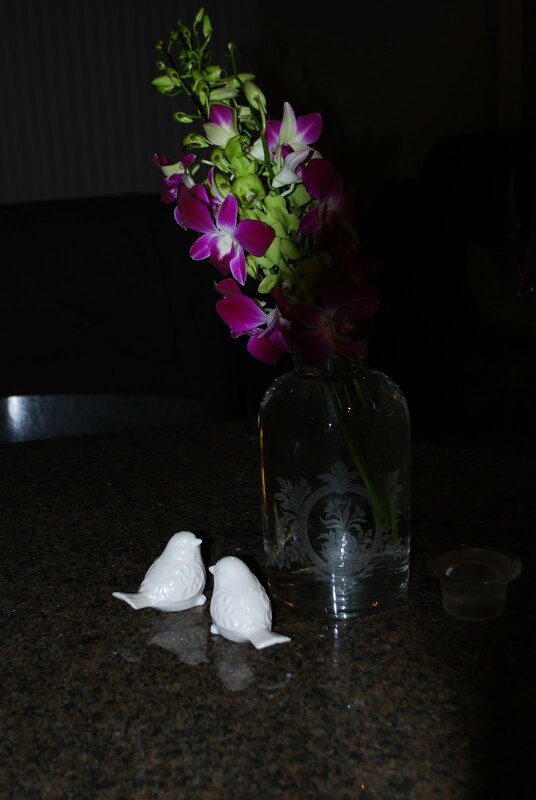 I can't help showing off my adorable etched vase- $8 from Marshalls! OK. So those were basically all my obstacles... Phew! I decided to make half of this recipe since we certainly didn't need a whole one. 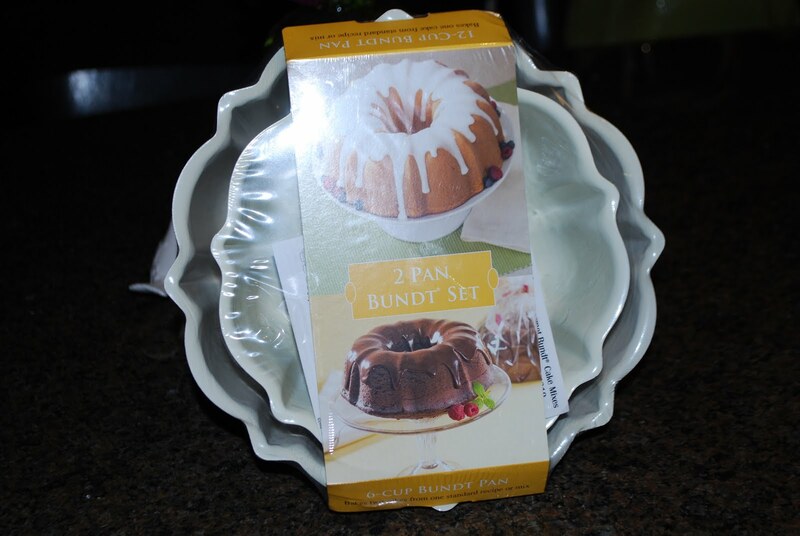 Besides, I knew a baby bundt would look super cute on my never-been-out-of-the-cupboard mini cake stand. Ding ding ding- sooo right! OK don't make fun of my icing job...I had some issues as I note at the end of this post...Let's focus on the good stuff. 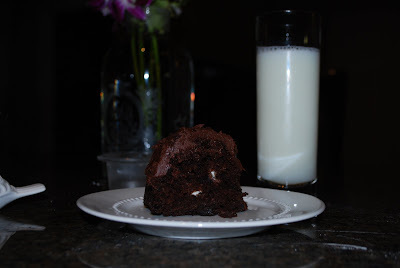 The cane sugar in the root beer really makes this cake so sweet, moist and extra delicious! I really didn't think you could taste the root beer, but I wouldn't have minded either way. 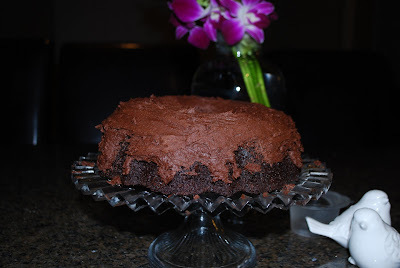 After I made this cake I handed a piece to the bf who dug in- "This is delicious! So moist!" he said. Then right after the next sentence left my mouth, "It's root beer chocolate cake!" I remembered... He hates root beer! His face dropped. "Eww! This is disgusting! It tastes like root beer!" Hmmm... he totally had NO clue, and I ruined it for him. I started cracking up. "Fine. More for me!" :) He really wanted to like it every time he saw me eating it, so he tried it again a couple days later. He asked if I could switch the frosting for him..."Umm do you want me to wash it off?"... He thought the frosting tasted too "root beery." 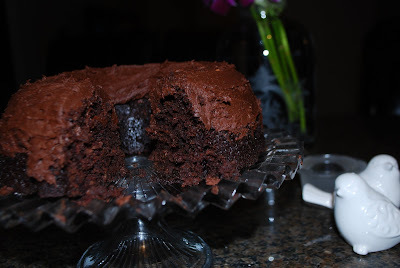 The frosting did not taste like root beer (my half portion had 1/8 cup of soda), but it did have a little zing to it- delicious in my opinion- especially warmed up! 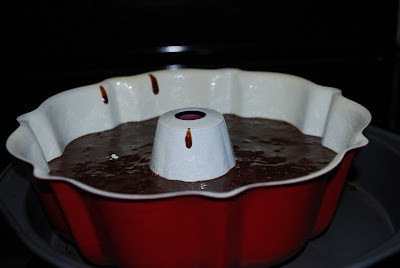 Extra bonus about this recipe- it's easy- no mixer needed! :) I think I'll make this again soon with Coca Cola made with cane sugar instead. I bet its equally delicious and the bf will be oh-so-happy! Preheat oven to 325. 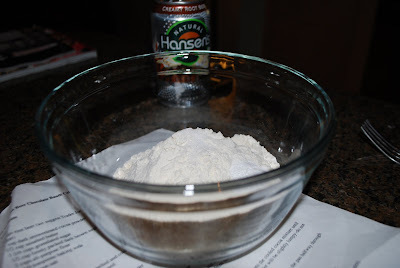 Butter and flour bundt pan (I use the baking spray that does both for you). 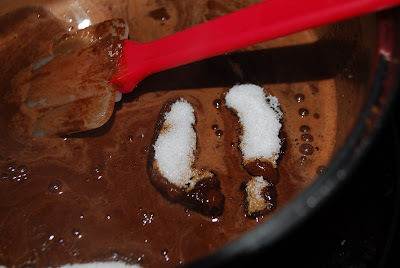 In a small saucepan, heat the root beer, cocoa powder and butter over medium heat until butter is melted. 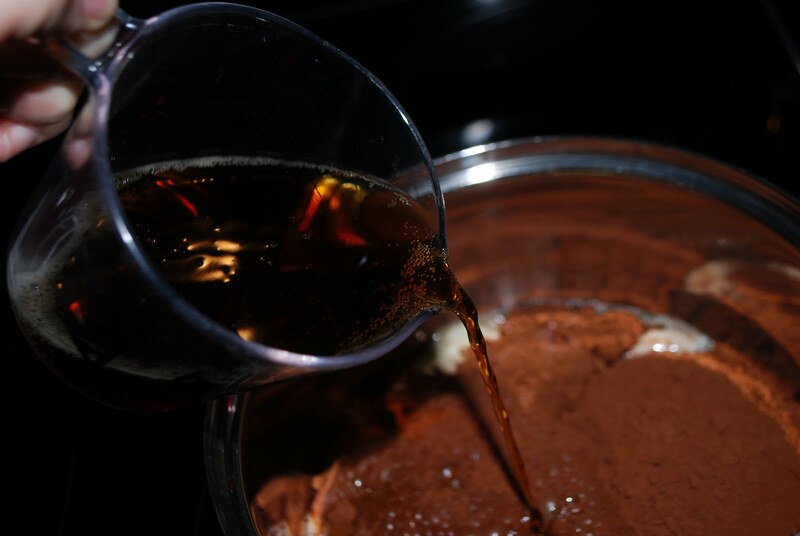 Add sugars and whisk until dissolved. 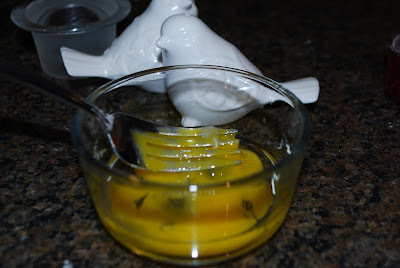 Remove from heat and let cool ( I put mine in the fridge for 5 minutes). In a large bowl, whisk together flour, baking soda and salt. 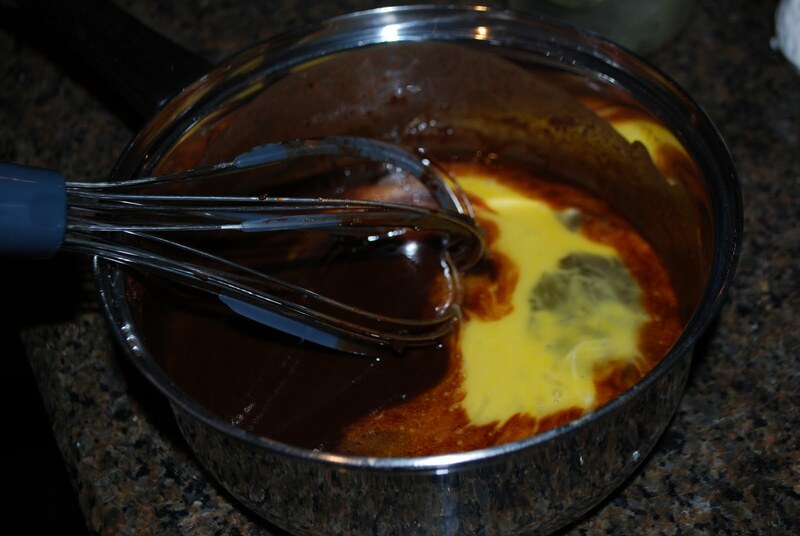 In a small bowl, whisk together eggs until just beaten and whisk into cooled cocoa mixture until just combined (make sure cocoa mixture is cool enough that it doesn't cook the eggs). 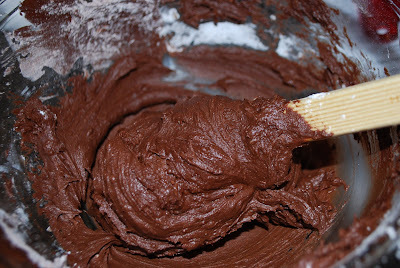 Gently fold flour mixture into cocoa mixture. The batter will be slightly lumpy- that's OK-do not over-beat or the cake will be tough. Pour batter into prepared bundt pan and set onto larger baking pan (to avoid burning). Bake 35-40, rotating halfway through baking time (Hmm I think I forgot this part and mine turned out fine). Make sure small knife inserted into the cake comes out clean. Cool cake completely before icing. 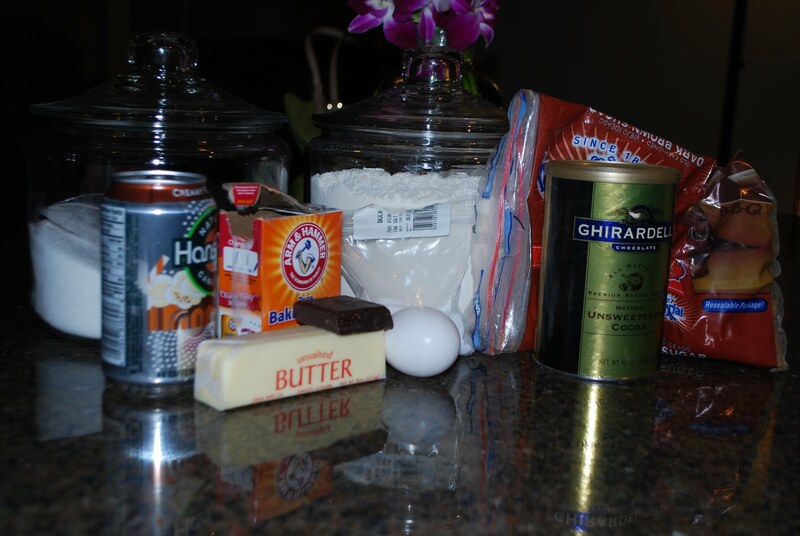 *If you want to make a baby bundt like mine, just halve everything and bake 30 minutes. For the frosting, melt the chocolate over low heat on the stove (or in micro). 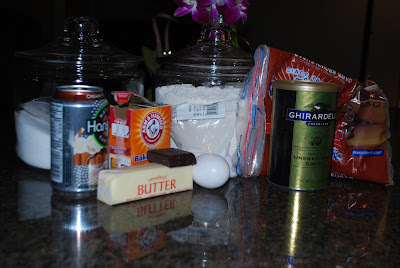 Add the rest of the ingredients and stir. Take mixture off heat and allow to cool in fridge for 2 minutes. 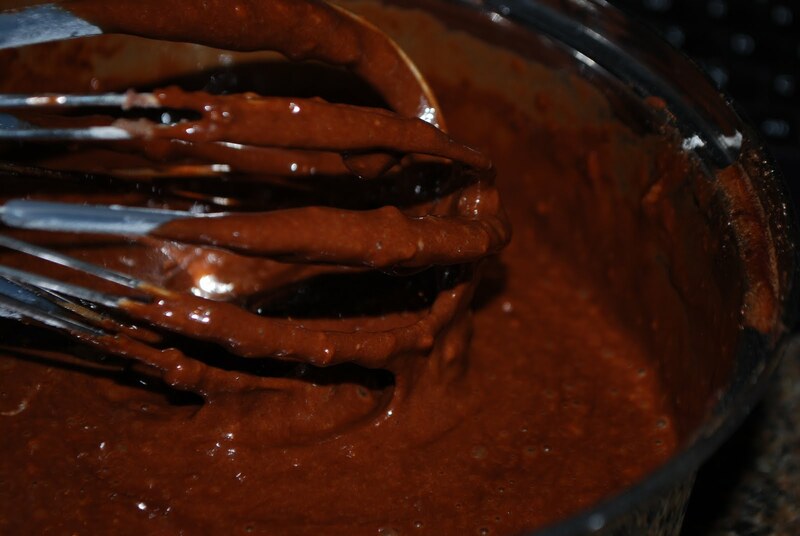 Whisk cooled mixture and make sure its stiff enough to frost. OK. So I had some trouble icing this cake. 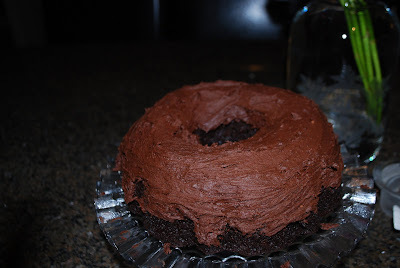 MAYBE I didn't wait until it was cool enough, but does anyone have tips for icing a bundt? Mmm so rich and delicious! I usually make my frosting thinner (not too thin, but thin enough to pipe) and drizzle across from inside to outsde of the bundt cake rather than frost it. It allows the decorative shape of the bundt to show through and you can play with the thickness or thinness of the frosting for the look you want. 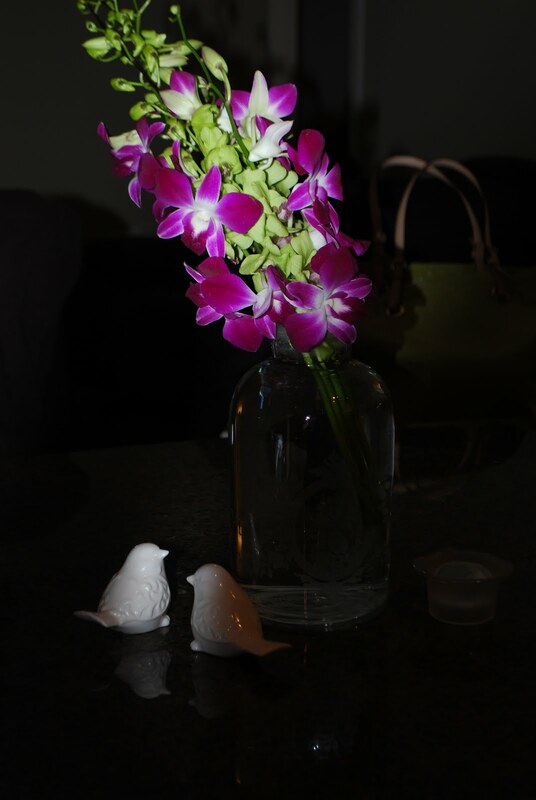 You can also use dark and light frostings to make a pretty contrast. Also, Your cake sounds amazing! I can't wait to try it!